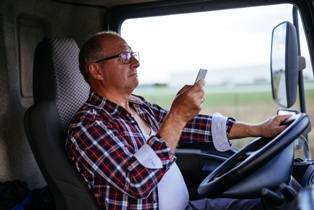 Truckers Cannot Text and Drive in Indiana | Keller & Keller restricting the use of hand-held devices for all commercial drivers, including truck and bus operators. The motivation for this rule was FMCSA research that found that commercial vehicle drivers were 23.2 times more likely to be involved in a crash, near-crash, or unintentional lane deviation while they were texting than when they were not. Their study found that drivers take their eyes off the road for nearly five seconds when they are sending or reading a text, traveling the length of a football field. What is considered texting under the law? FMCSA defines texting for the purposes of this law as manually entering text into or reading text from any mobile device. Along with texting, the law also applies to emailing, instant messaging, and pressing more than a single button to make or end a phone call. What Are the Penalties for Truck Drivers? What If Your Accident Was Caused by a Texting Truck Driver? If you were seriously injured or a loved one was killed in an Indiana truck crash, you need the help of a law firm that is experienced in these kinds of cases. Along with securing the truck’s data recorder, an attorney will investigate the possibility that the driver was in violation of the texting and driving law. This can pin 100 percent of the blame for the crash on the truck driver and protect your claim for the damages you are owed. Don’t trust your commercial truck accident to just any personal injury attorney. The truck accident attorneys at Keller & Keller have the experience necessary to get you the compensation you deserve when you are injured by a negligent truck driver. Start a chat with one of our attorneys now or fill out the form on this page to connect with us today.